Somerset have signed former Australia and Netherlands fast bowler Dirk Nannes for their 2014 T20 Blast campaign. The 37-year-old left-armer has played in 17 Twenty20 internationals, as well as featuring in the Indian Premier League for the Delhi Daredevils and Chennai Super Kings. He has also played T20 cricket for Nottinghamshire, Surrey and Middlesex. "I've always been envious of the long and continued success that Somerset as a club seem to achieve," Nannes said. "It will be good to have the shoe on the other foot, and I will hopefully be able to contribute to a nice winning streak. 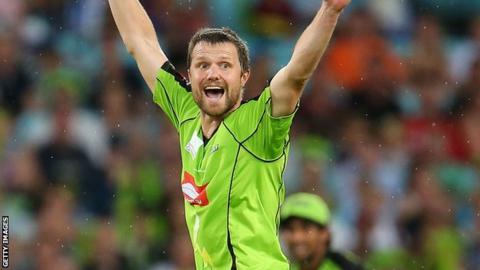 "I am now living very close to Taunton, so it feels like I'll be playing for my local team," added Nannes, who has played 189 domestic T20 matches around the world. He was set to play for Glamorgan in last year's Twenty20 competition last year, but was forced to withdraw after suffering a back injury. Nannes, who played two T20 internationals for the Netherlands before switching to his native Australia, played for Surrey in 2011 and 2012, and became the first bowler to take 100 Twenty20 wickets while at Nottinghamshire in 2010. "We are really excited to have signed Dirk Nannes for the NatWest T20 Blast after what has been a rather lengthy and tough search," said Somerset director of cricket Dave Nosworthy. "We have always been intent on trying to find a quality international player who was prepared to commit to the entire competition. Dirk fits the bill on both counts. "Having previously worked with Dirk I know that he is a very good team man and I have no doubt that his off-field contributions will be just as important as his on field performances."